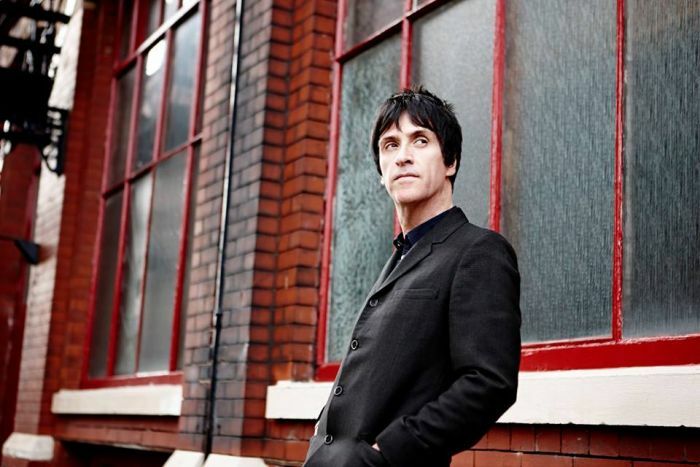 Ahead of a tiny warm up gig at the Arts Club later this month, Getintothis’ Jamie Bowman counts down Johnny Marr’s top ten musical exploits. Unlike his former writing partner in The Smiths, Johnny Marr has never seemed as comfortable with a solo career as Morrissey. Straight after The Smiths’ dissolution, it was Marr who had originally intended to form his own group only to change his mind when faced with the likelihood that any new ensemble would face insurmountable comparisons. Since then Marr has embarked on a peripatetic career, most often as a gun for hire for the likes of the Pretenders, Bryan Ferry, Talking Heads, Beck and even the Spice Girls. His apparent longing to be in a band has led to surprising stints in The The, Modest Mouse and The Cribs while his three albums in partnership with New Order’s Bernard Summner as Electronic saw him coming closest to rediscovering the Mancunian magic of The Smiths. 2015 finds him finally bowing to the inevitable as a fully fledged solo artist with last year’s Playland album following 2013’s The Messenger. Oh and did we mention his exceptional hair? Marr’s first example of extra-curricular activity was way back in 1984 and came as a shock to those who regarded him as the king of indie guitar. Mike Pickering (who later formed M People) was the man behind Quando Quango’s mix of post-punk electronica and proto-house. Chic fan Marr, who had spent over a year before the Smiths experimenting with funk, add some great Nile Rodgers-esque guitar to this song which doubtless sounded great at the Hacienda. The The’s mercurial leader Matt Johnson had asked Marr to guest on his new song but after a night of clubbing he woke up as a full time member of the band. He went on to contribute to their Mind Bomb album and it’s follow up 1993’s Dusk. It’s hard to take Johnson seriously after reading Luke Haines‘ Brit Pop book but this a great song. Despite joining The The, Marr also found the time to start another project that would go on to become perhaps the most successful of his post-Smiths career. Marr had originally intended merely to guest on a solo album by vocalist Bernard Sumner but the two hit it off and with the assistance of the Pet Shop Boys they crashed into the top ten with this sublime piece of adult house which features a rare Marr guitar solo. The Smiths and Bragg were kindred spirits throughout the 1980s when opposition to the Thatcher government was a given in the UK’s indie scene. Marr had contributed to Bragg’s 1986 album Talking To The Taxman About Poetry but by 1991 he was also producing an co-writing the Bard of Barking’s biggest hit. Although not appearing with Phil Jupitus and Kirsty MacColl in the video apparently. Following the one-off success of Getting Away With It, Marr and Sumner returned with a brilliant debut album which was a perfect fusion of indie and dance. This superb single was the undoubted highlight with Marr’s acoustic intro introducing a gem of a song which can’t help but recall the tale end of those heady Madchester days. Marr later claimed it was the best song he’s ever written. A beautiful video too. Marr again got to indulge his love of disco and funk by playing on Beck’s Prince-influenced Midnite Vultures album. Marr – clearly a big fan – compared Beck to Neil Young but their collaboration never went further this one great song. More please. Marr’s decision to join American alt-rockers Modest Mouse had a whiff of the mid-life crisis about it especially when he confirmed he was a full time member of the band. Marr played on the band’s 2007 album We Were Dead Before The Ship Even Sank which incredibly reached number one in the US, giving Marr the biggest hit of his career to date. Marr played a large role in making the score for the 2010 science-fiction classic Inception. 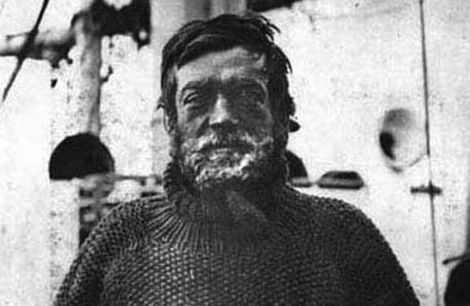 Using a 12-string-guitar, he produced repetitive, simple melancholic tones that became a character theme for the protagonist, played by Leonardo DiCaprio. “I kept coming up with this phrase ‘churned-up,'” Marr said, “You’ve got this character who all the way through the film has this underlying turmoil.” This is a fantastic live performance of Han Zimmer’s superb score. Almost 30 years after The Smith’s split, Marr finally seems at ease with his past with his last two albums returning to the classic sound of his former band and the guitarist happy to play and sing their songs live. New Town Velocity is a lovely example of those fluid guitar lines that made us all fall in love in the first place. 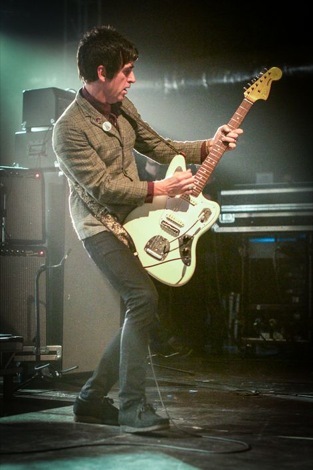 Johnny Marr plays the Arts Club, Liverpool, on March 25. Photo taken from Johnny’s Facebook page.